recently finished this commission for someone i met at WonderCon. he's an incredible artist and i wanted to make sure i spent some time on this piece. so he let me take it home and i mailed it back to him. 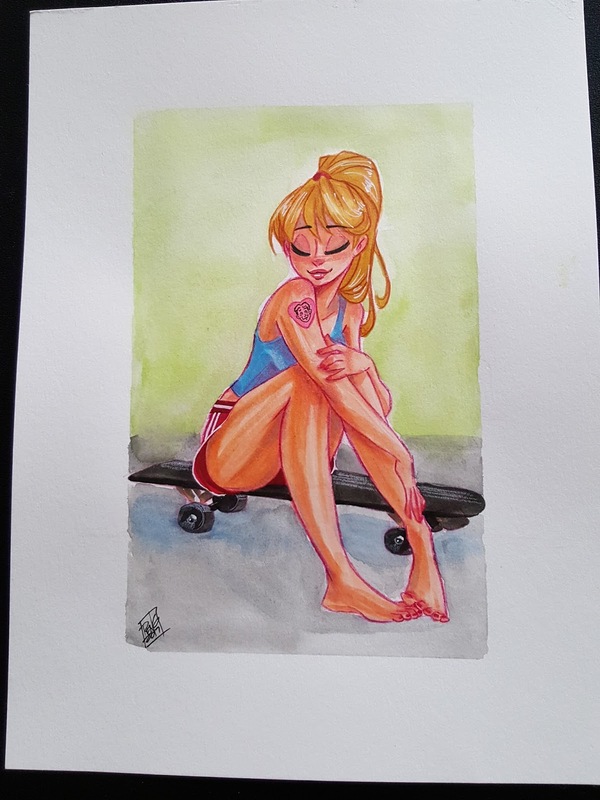 this is my first full watercolor commission and i was really quite happy with how it turned out. i've had to make some miracles happen with my super cheap watercolors that i've had for years. it's one of those that came in some "artist starter set" type things ppl buy for students or for someone that they know who like art but they don't really know what medium they like to work in. so it came with colored pencils, markers, graphites, pastels, and watercolors. to be fair, when i got this set of supplies, i had no idea what medium i liked to work in myself. but paint was certainly not one of them. now that i'm really enjoying working with watercolors, i wanna upgrade to some nicer watercolor sets, just to see where that takes me. image on the left is the cleaned up lines that i draw with my Derwent Inktense colored pencils. i like using these because they don't erase very much and i like how they blend with the paints. 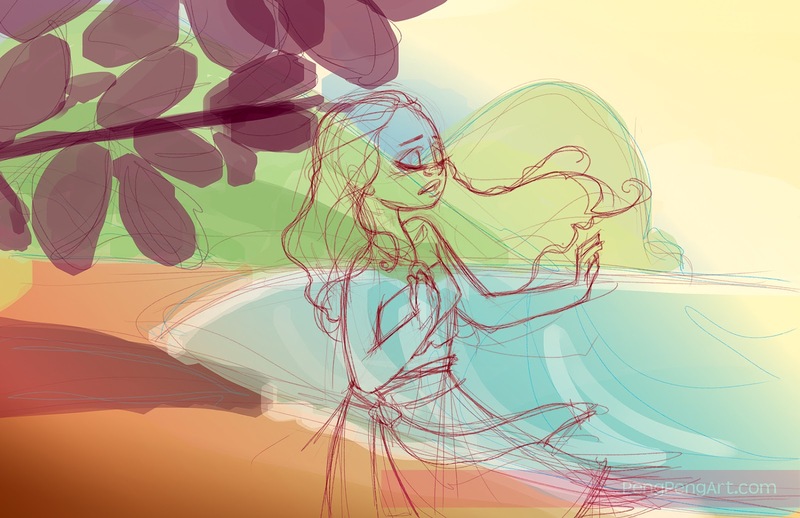 once i finish the loose sketch, i go over it with the colored pencils and then i go straight to paints. and once i'm done with the painting, i go over some of the lines again with the colored pencils, depending on if any of them need redefining. i've posted the progress shots to my Patreon supporters so if ur interested in those, click the big orange PATREON button at the top and join us! 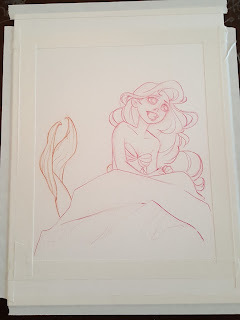 i'm finally able to update this with some pics of commissions from WonderCon. i had a wonderful time and just wanted to thank everyone for the very kind reception to the show. like i mentioned before, i sold out of my premium prints. ya'll sure know how to make a gal feel welcomed! the first one is Betty of Betty and Veronica. 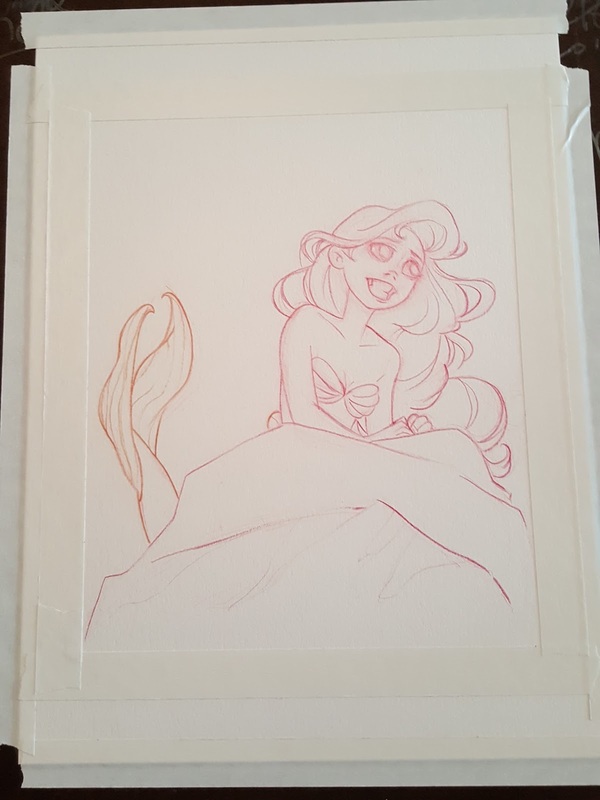 this one was a pre-con sketch that was picked up at the show. 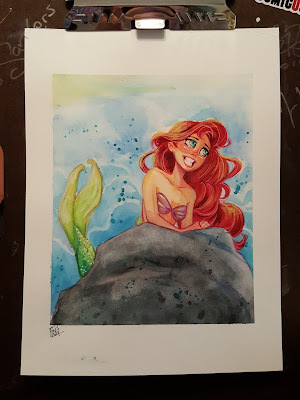 so i was able to use just a little watercolor in the background. 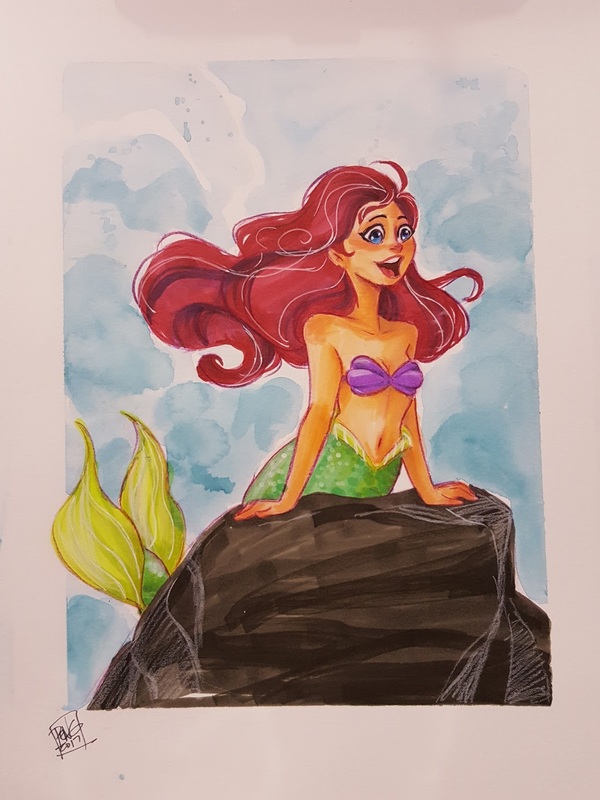 the sceond is my favorite thing to draw - Ariel! i actually brought some watercolors for the first time ever to a con but i was afraid to do a full watercolor piece at the show (cuz i'm a spiller, no doubt) so she's colored with mainly my Copic markers but the background was all watercolors. i think i'm gonna leave my watercolors at home. it just gets too busy and messy when i try that at a convention. just not enough time to devote to it, unless i wanna just ignore everyone that stops by the table. which is a no-no in my book. i've just gotten back from a local comic con/event and i was able to bring more premium prints there. had to order them in short notice, which i try not to do to our awesome print shop. but if they weren't so great with their print quality, i wouldn't run out so fast. =P then this saturday, i'm headed to another local event which specifically celebrates the Starz show SPARTACUS. if u haven't seen it before, it's all on Netflix now if u wanna binge it. but be extra-warned, it's 100% for adults! i love my cute stuff, i love my Disney, but i'm an adult and i also enjoy my adult-themed entertainment. Spartacus was one of those shows that i just thoroughly enjoyed from the action to the violence/gore to the "adult content" parts. so this event coming up is the first time i'm attending one of these. it'll be....interesting...to see how it goes. either way, i'm excited to meet some new folks! here's the newest addition to my large premium felt prints - MOANA! of course! 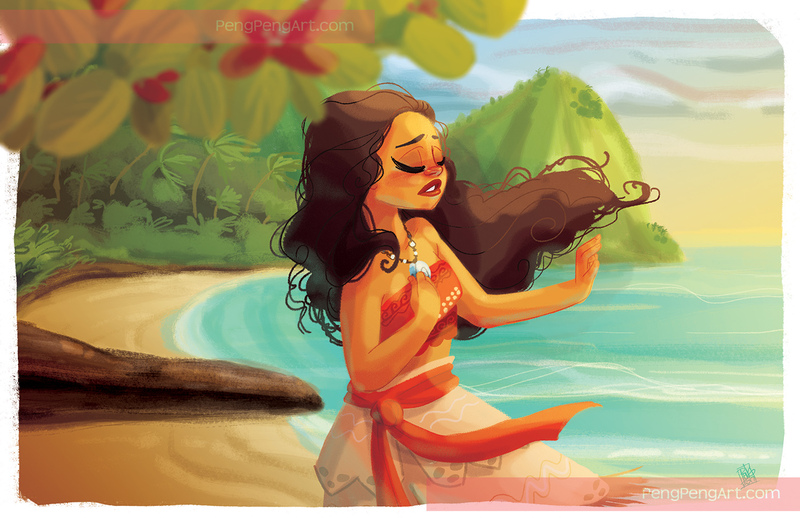 i've been wanting to do a moana tribute since i saw the movie but i had to soak it in. i worked on the background a little longer than i expected, and i still wanna work on it more. but everytime that happens, it ends up getting overworked and it shows. so i had to call it a day. i just came back from doing WonderCon in Anaheim, CA for the first time. that was the first show i brought her to and by Sunday morning, she was completely sold out, including the display! so i think i'll call that a success. 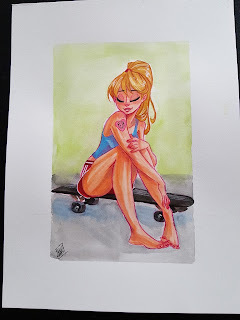 =) the show cleaned me out of my premium prints so i am getting a fresh batch in this week to bring with me to the smaller local shows happening at the end of the month as well as adding them to my Etsy. here's the prelim sketch with some very loose color treatment. i showed progress shots on my Patreon so if you'd like to see those, head on over to www.patreon.com/pengpengart, check out my reward tiers, and consider a pledge!